The Trybike is the first 2-in-1 Balance Bike - Black made of steel! It can easily be converted from a tricycle into a bicycle with a few simple steps. The perfect all-in-1 bike to help your child transition from crawling, to walking, to balancing, to riding. Made using a thoroughly durable construction combined with stunning details and a quality finish, the Trybike 2 in 1 Balance Bike is bound to be a firm favourite. Why should I choose the Trybike Steel 2 in 1 Balance Bike - Black? The Trybike is the first 2 in 1 Balance Bike made of steel! The bike can be converted from a tricycle into a bicycle with a few simple steps. Initially, the low seated tricycle gives your nipper lots of help in learning how to walk and then ride - so exciting to play with for your 15 month to 2 and a half year old. Having mastered the first stages, the Trybike 2 in 1 Balance Bike comes into its own: It is easily adapted into a low bicycle so your roaming rider from 2 to 6 years can start to learn how to balance with confidence. The seat height ranges from 30cm to 45cm and the brakes are your child's feet! As a tricycle, the Trybike weighs just 6.3kg then as a bicycle it weighs 5.2kg. The spoked wheels are 12 inches in diameter. 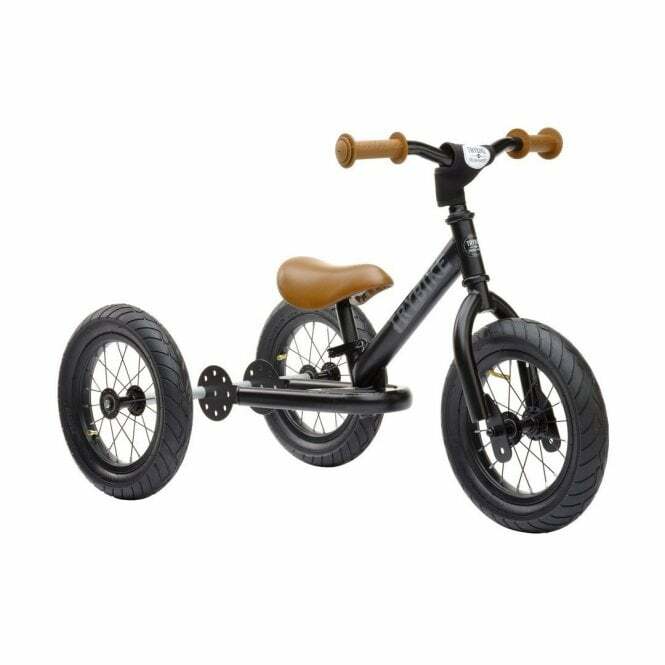 The nylon bushings, sealed, smooth cartridge balls and extra wide rubber tyres with inflatable inner-tubes all provide the quality and sturdiness to make this 2 in 1 Balance Bike a go-to playtime friend. With the addition of the included vinyl stickers, there is plenty of scope for your child to personalise their Trybike 2 in 1 Balance Bike making it a treasured rite of passage.